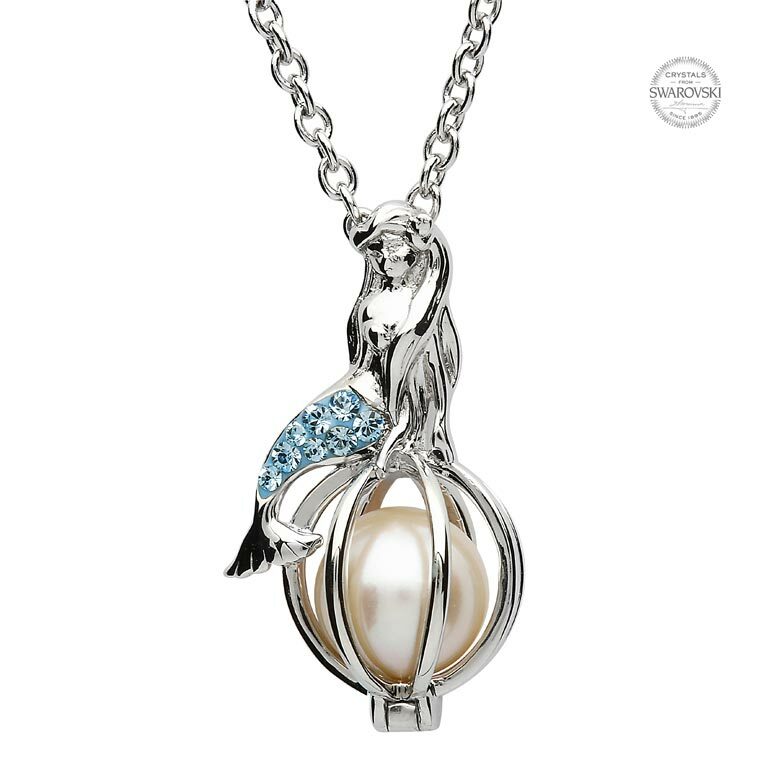 Crafted in Sterling silver and embellished with aquamarine blue Swarovski® crystals, its pendant features a seductive mermaid that sits atop a spherical silver cage with a luster-filled Swarovski® pearl inside. The mermaid is adorned with aquamarine blue Swarovski® crystals. Mermaids and pearls are two of ocean’s most mystical treasures that convey feminine grace and purity. Aquamarine crystals evoke ocean’s sacred energies. A thin silver chain passing through an invisible bail completes the piece. Wear this necklace to feel like a queen. The blue mermaid and caged pearl pendant necklace is crafted in Sterling silver and embellished with aquamarine Swarovski crystals and a Swarovski® pearl. The pendant features a crystal-studded mermaid sitting atop a spherical cage that holds within a lustrous pearl to symbolize queenly grace in the wearer.